That’s why we take a special approach to it. Quality is top priority to us. Continuous quality monitoring and a motivated team that always works to optimise our workflows are part of our corporate policy. We are certified to ISO 9001, thus boosting our customers’ competitiveness and capacity every day. Ckick here to view the proof of validity of our certificates. Because we are a responsible company, we have imposed high standards on ourselves. The quality of our services and environment-friendly way of doing things are key aspects of our philosophy. Apart from ever-more stringent quality controls, the keen and interested attitudes of our staff help to optimise the work processes aimed at finding faults quickly, fewer production rejects and shorter set up and production times. We, as a creative ISO 9001 certified company, secure the competitive and performance standards of our customers on a “day to day” basis. For us “think no limits” means guaranteeing the high quality standards of our products now and in the future. The fact that we also feel responsibility for our environment is also mirrored in the almost entire usage of materials from the re-growable material sectors. Our close ties to the RESY recycling association ensure that our packaging materials really do stay in the secondary material cycle and that corrugated board continues to hold its leading position as an environment-friendly packaging material. The demands of branded companies and private label producers – especially from the food and pharmaceutical industry – are constantly increasing with regard to hygiene issues. In order to meet the demand of this branches of industry for hygienic corrugated and solid fibre board products, the European professional associations FEFCO and ESBO together with leading international food companies elaborated a hygiene guideline, the so-called GMP standard (GMP = Good Manufacturing Practice) and adopted it as an industry standard. As a premium partner of the food industry, it goes without saying that we implement and stand for comprehensive hygiene concepts as well as the ”Guidelines for Good Manufacturing Practice of Packaging made of solid fibre and corrugated board“ (GMP) in all stages of production. 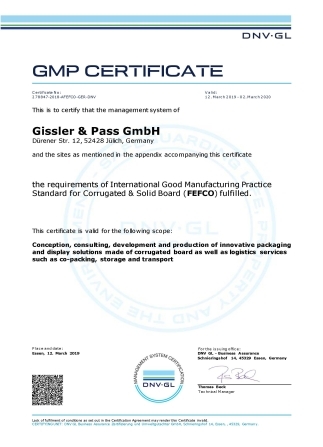 Since the beginning of 2008, all four plants of Gissler & Pass – and therefore all departments: offset printing, corrugated board and display production and co-packing – have been GMP FEFCO certified. 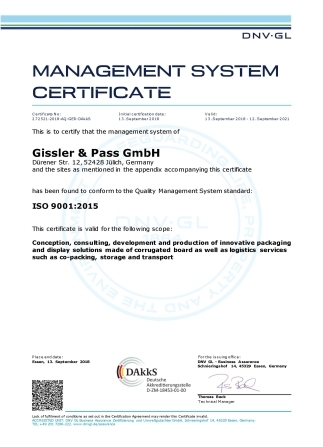 As a responsible company Gissler & Pass views protecting the environment as being a key part of its company philosophy. The increased ecological awareness of consumers and the growing demand for bio-, eco-, and fair-trade products mean this is something that we cannot avoid. 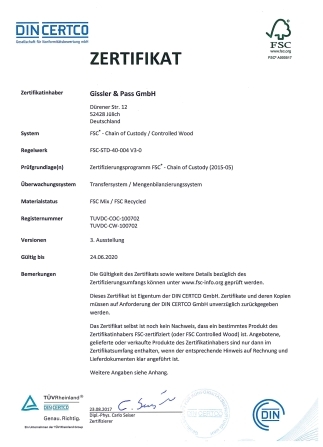 With the FSC® seal Gissler & Pass will be able to document its responsible use of natural resources and its contribution to the prevention of the advancing global destruction of the rainforests to its customers from the areas of retail and industry and in turn to the end-consumers. 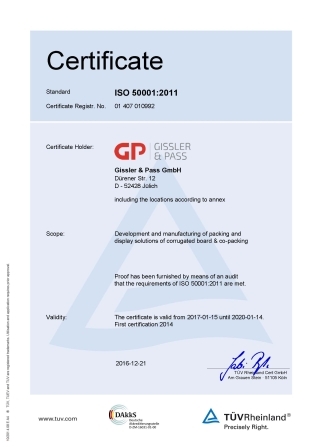 Since the end of 2013 Gissler & Pass is certified according to ISO 50001 Energy Management with all plants. 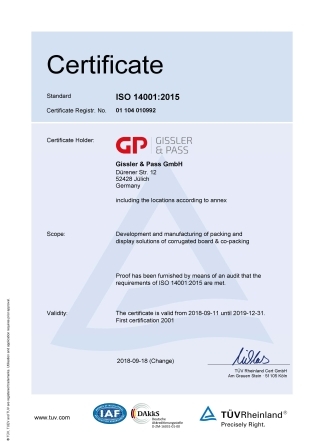 This successful certification is proof that Gissler & Pass sustainably improves energy efficiency, steadily lowers energy costs and protects the Environment.